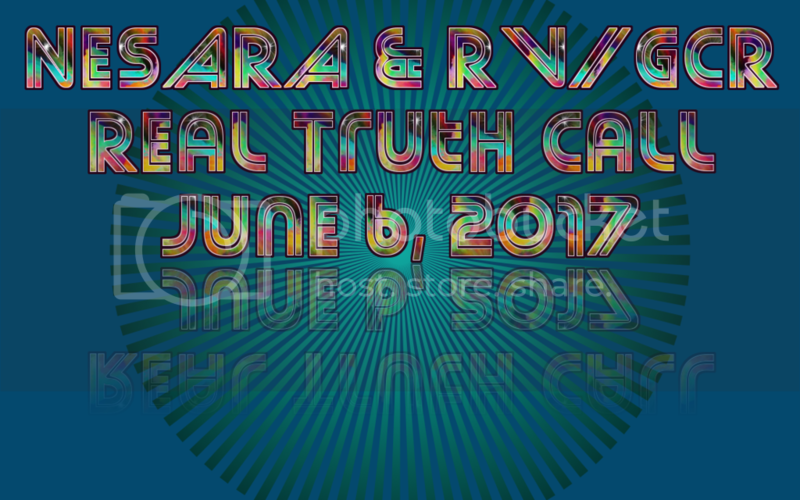 The following are notes taken from the Real Truth Call which took place on June 6, 2017. Fisher came on the call and gave his intel report and also read a report given to him by Tank. You can listen to the full call at this link here. You can also visit the Real Truth Call website at https://www.realtruthuniverse.com . I have edited and put together the intel portion of the call and can be listened to at https://youtu.be/mjBu2uk0Blo. Yesterday morning (Monday June 5th, 2017) Wells Fargo had a state/union wide conference call. All staffers on the call were told that the RV is in progress. They were told about all the 5 currencies in the first basket and to expect the RV in about 4 - 6 days (Friday, June 9th - Sunday, June 11th). The ZIM currency hit its "goal rate" on the higher tier trading platforms and is now no longer being traded. Tier 2 and Tier 3 currencies are being exchanged, "without a doubt" says Fisher. Fisher says that these higher tiers are liquid meaning they have spendable money after their currency exchange has taken place. The banking institutions and cabal families being audited which were discussed by Tank in previous intel updates have been completed as of Monday June 5th. Those who were audited and did not pass are no longer eligible to participate in the GCR/RV which will prevent cabal members from exchanging along with the public. Fisher says that one of the higher Tier church groups have already exchanged their currency and have signed strict NDAs. Fisher says that this church group also received prosperity funds of $1 million dollars each associated with NESARA in addition to their currency exchange. 140 cabal members/politicians have been detained and been placed under some type of amnesty program with ankle monitoring bracelets. Some were given the option to resign and given immunity packages. The whole process was triggered today at 5:30 est. All funds have been returned to the core accounts, which are the Tier 1 groups like the Admiral's Group. HSBC bank will remove administrative hold after the Farmer's Claims are settled. The Farmers Claims are tied in with NESARA and Prosperity Programs. 800#s were released at sometime during this process, all the codes are in, and the trigger is pulled and set to another algorithm timer. These algorithm timers are usually set for a 72 hour window.